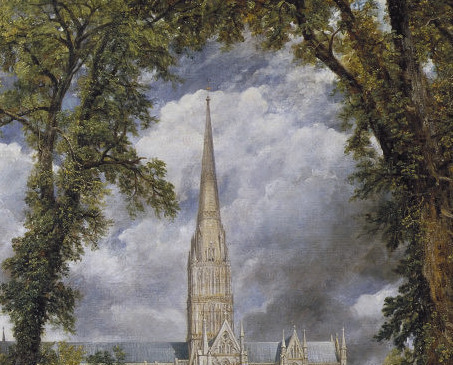 Constable was not the first painter to be attracted to Salisbury Cathedral, although his oil painting may be the most successful and well-known image of the building and its surroundings. Constable looks at the Cathedral from the woodland through green pastures and typical of his work, he depicts country gentry looking on as well as cattle grazing. The cathedral featuring in Constable's work first went under construction in 1220 and it is famous for having the biggest cloister in England as well as being the guardian of the Magna Carta. The Cathedral would have been central to the 18th century community which Constable was part of and it is known from his writing that he himself was deeply religious. 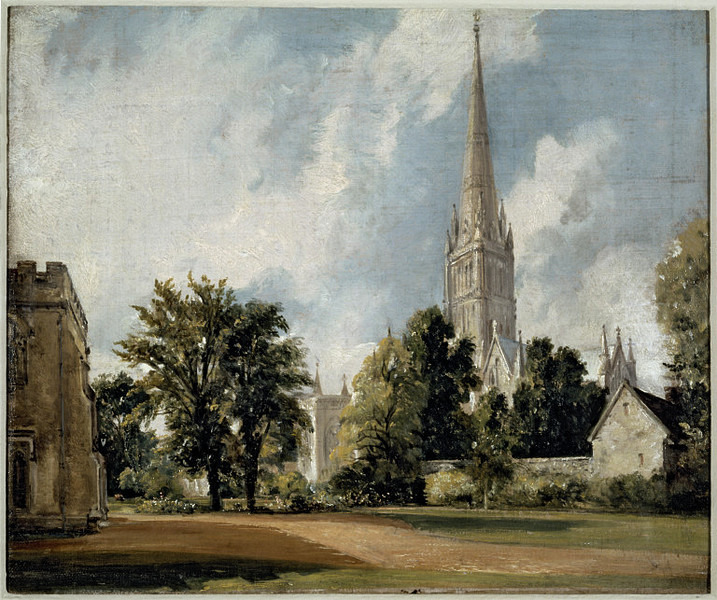 As well as being a building with which Constable had a great affection for, the Cathedral and its surroundings would have been considered typically English at the time. Undoubtedly this would have caught the artist's imagination as well as that of his French market. Although Constable's main focus in this painting is the cathedral itself, the foreground draws the viewer's eye and is filled with tame woodland and pastoral animals. This view is from the grounds of the Bishop's palace, and is a typically pastoral scene reminiscent of Constable's other paintings. John Constable's Salisbury Cathedral from the Bishop's Ground was inspired by some of the great landscape painters that came before him. Men such as Claude Lorrain and Thomas Gainsborough were key in the development of Constable's art and their influence can be seen in comparisons between their work and Salisbury Cathedral from the Bishop's Ground. 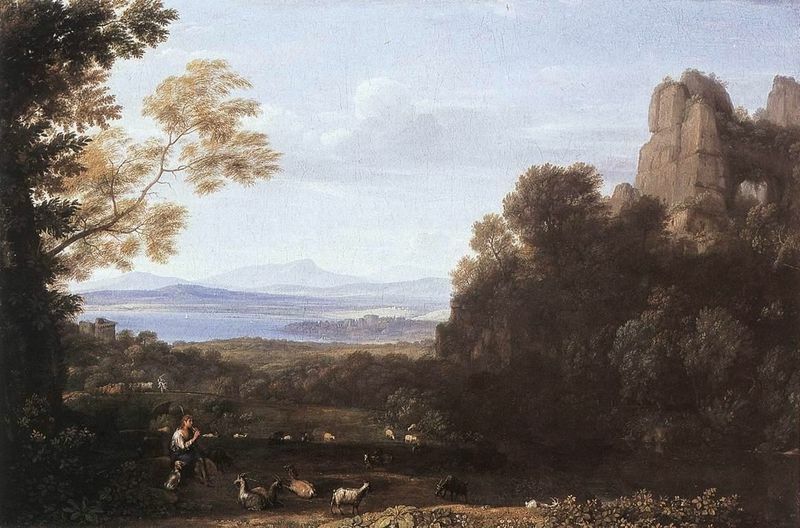 Lorrain was a master of Baroque landscape painting, a genre which was not deemed proper in the portrait painting art world of the time. 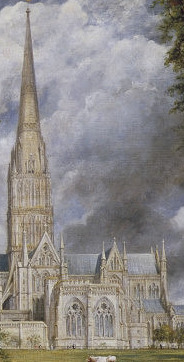 Paintings such as Landscape with Apollo and Mercury use a similar tree lined composition to that of Salisbury Cathedral from the Bishop's Ground. 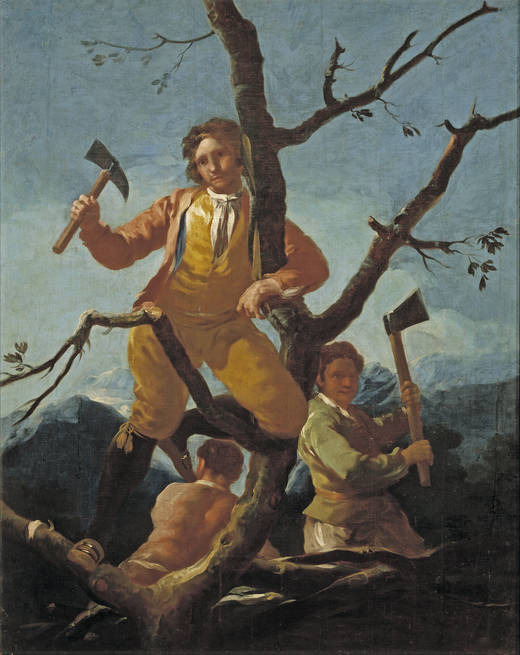 The use of human or animal figures in the foreground is also very similar and helps to add a human element to the piece. 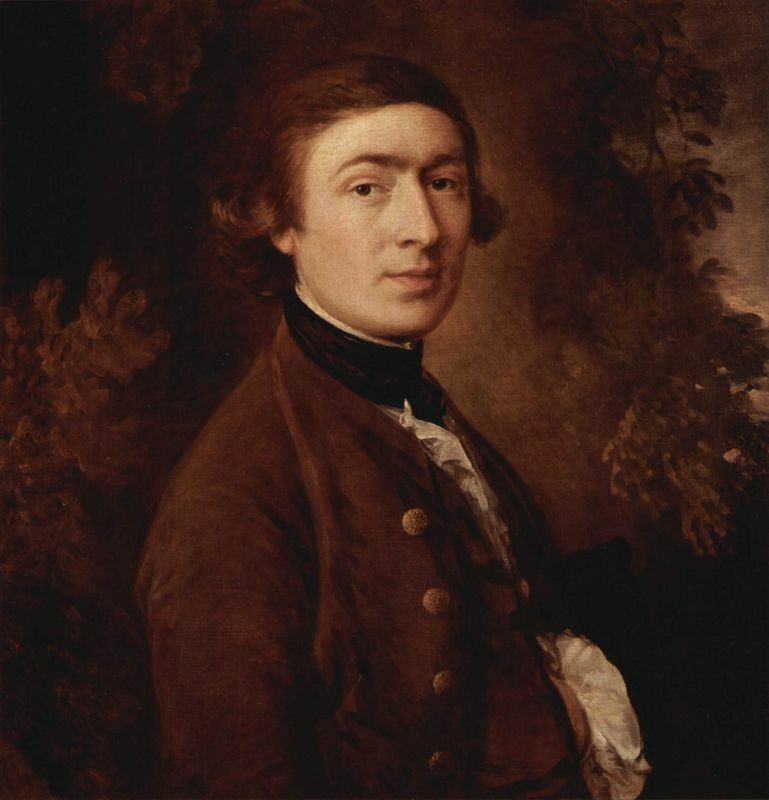 One of the first truly important English artists, Thomas Gainsborough was noted for his portraits but was also a very successful landscape painter. He was also from Suffolk, England and would have grown up in and captured the same landscapes as Constable. Constable would carefully construct his compositions, creating many preliminary sketches before starting to paint to make sure he would be totally satisfied with the results. Salisbury Cathedral from the Bishop's Ground is an obvious example of Constable's dedication to getting the composition right as he has used so many artistic techniques to ensure the view he wanted. The arch of the trees perfectly encompasses the cathedral spire and frames the building. The lighter shades of the cathedral and the fact that it is bathed in sunlight draw the eye to it. 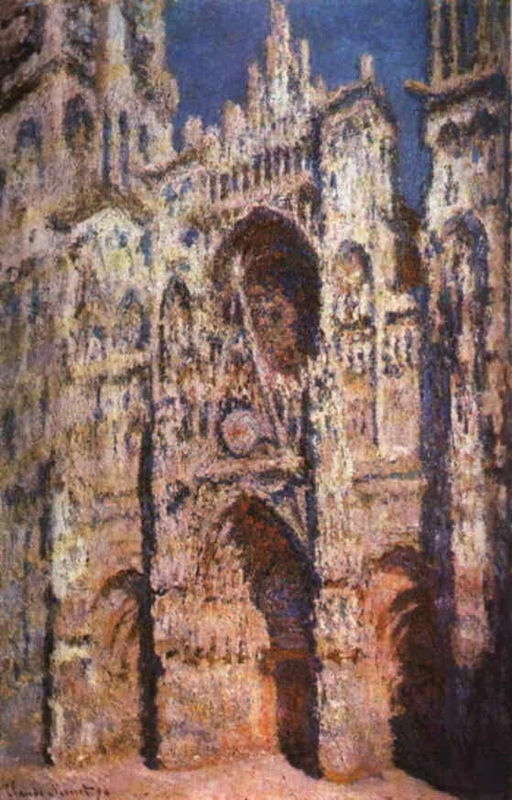 The figures to the right of the image also turn the viewer's attention to the cathedral. With their backs turned and the gentleman pointing at the building with his walking cane it is almost as if you enter the 19th century world and see the cathedral how Constable's contemporaries would have seen it. 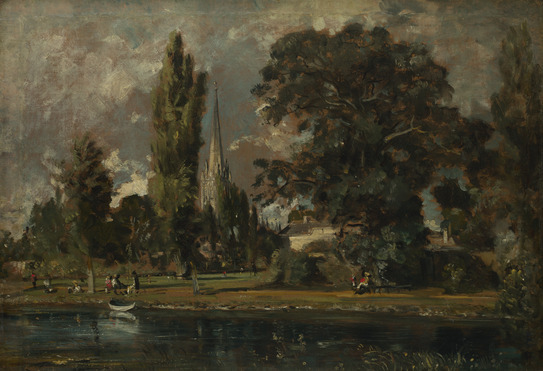 Constable was outspoken about the way many of his contemporaries alternated or created landscapes to suit their purposes, so it is more than likely that this piece was based on the exact view of the cathedral during the artist's lifetime. Constable was a very innovative artist of this period and used a thick "impasto" brushstroke throughout his work. This technique allowed him to not only create depth and movement in his work but also realism and detail. An innovator for depicting natural beauty and reality in art during the 19th century, Constable was noted for using earthy, natural tones. He would also mix colors over one another on the canvas to create depth and movement. One example of this is in the artist's trees; he uses reds to compliment the otherwise overly green painting and this created deeper tones and contrast in the piece. 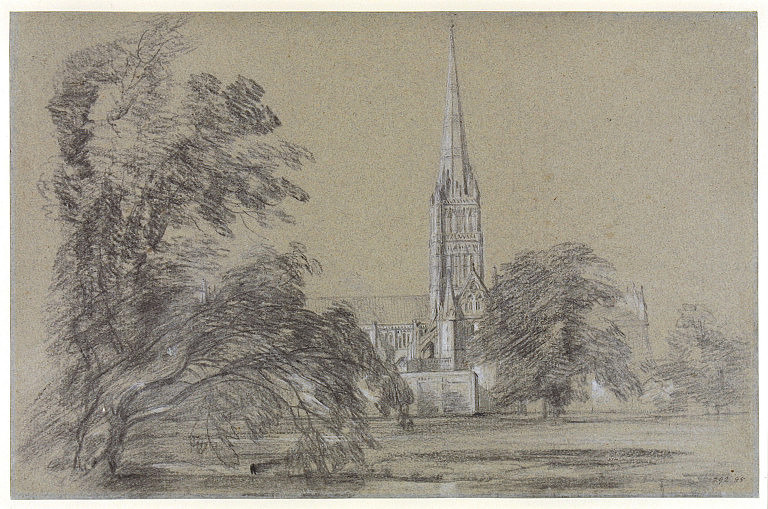 Constable's use of lighting in Salisbury Cathedral from the Bishop's Ground is best demonstrated in the contrast between the woodland and the meadow in front of the church. The stream acts as a divide between the two areas and thanks to the shade given by the trees the wood appears much darker, with the artist employing the use of browns and dark greens in contrast to the paler yellows of the distant meadow. The cathedral is lit by the sun which draws attention to it. 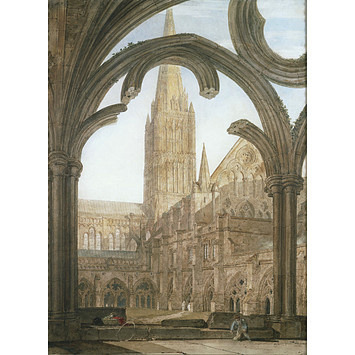 As the focus of the painting this building is highlighted and its possible that with this Constable was trying to evoke the sense that the building, being a house of God, was higher and more important than the everyday people and objects surrounding it. 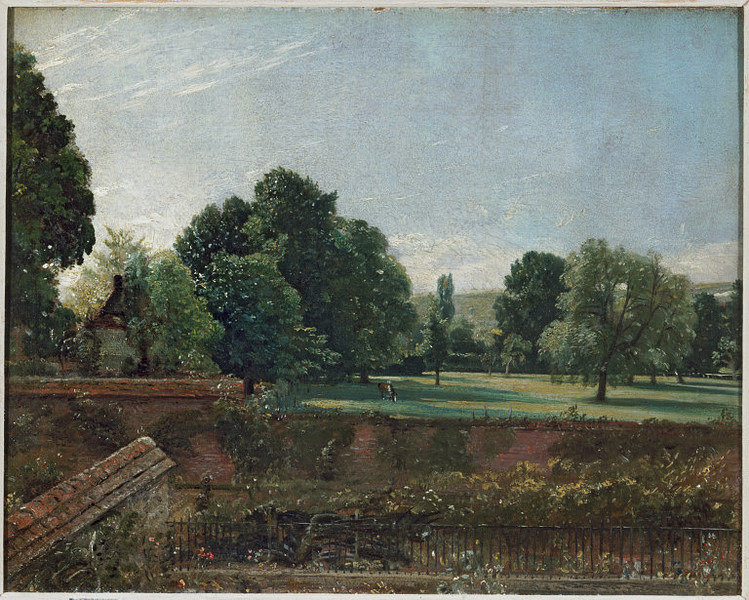 Constable is known to have spent many hours sketching before committing to painting. Salisbury Cathedral from the Bishop's Ground would not have been any different and many of his oil sketches of the composition can be seen at the Victoria and Albert Museum in London, England. Cathedrals have long been a source of inspiration for artists through the centuries. Their size, importance within society and mystical, spiritual quality has always drawn been attractive and Salisbury Cathedral from the Bishop's Ground is no exception. Constable himself made several studies of this particular place. Salisbury Cathedral from the Bishop's Ground was not considered to be a great painting in England and as with many of the artist's work eventually went on to be sold in France. 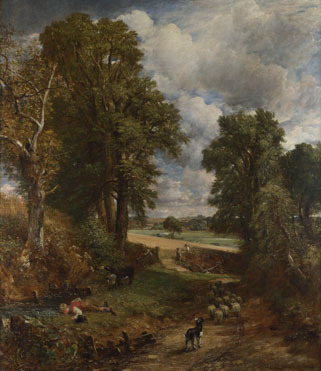 Today, however, it is regarded as one of his best works - his composition, color scheme and subject matter come together to produce a painting that embodies the English countryside. 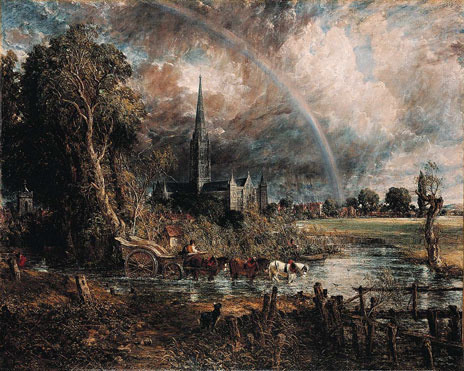 Constable was dedicated to Christianity as well as his love of landscapes. Without completely focusing on the great architectural beauty of the cathedral in this piece, the artist instead places the animals and people in the foreground of the piece which may have been a reflection of his thoughts about nature and God as the creator of nature. 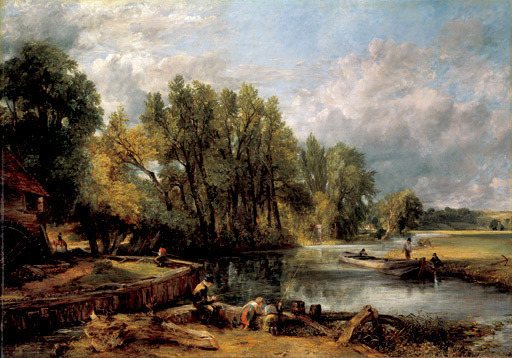 Constable spent most of his youth in the English county of Suffolk, sketching the landscape which would feature in all his artwork as an adult. Although Constable started to display at the Royal Academy by 1806 he remained unpopular in his native England until after his death. Luckily for Constable, French patrons found his work much more appealing and he began to sell a lot of work in Paris. Although he was popular outside of his own country Constable never left England and only ever painted landscapes of his beloved Suffolk.